Individual advocates have more power than many realize, especially within local government. Here are ten tips to get your voice on paper and into the mailboxes of decision-makers. If you have been involved in the Heartside Quality of Life Study or are interested in advocating for the Heartside Neighborhood's power in the City of Grand Rapids, attend the City Commission meeting on Tuesday, April 9th at 7:00 pm. 300 Monroe Ave. NW Grand Rapids, MI 49503. To many, reaching to a public official about their cares and concerns can be intimidating. Most Americans never reach out to an elected representative, and although there is pessimism about resident power within government, Grand Rapids public officials say that they care about the opinions of the people, especially through letter-writing. “Sharing personal experience, research, and policy considerations are always helpful to navigate the most appropriate path to take for the good of the City,” says Grand Rapids City Commissioner Kurt Reppart. Sara Vander Werff, Grand Rapids’ City Comptroller, says that what she hears at home and in her neighborhood affects how she approaches change even though she cannot vote and make policy. And the most effective way of getting hold of her? Letters. “I’m a little old-fashioned; a well drafted letter will get my attention sooner than an email these days.” Comptroller Vander Werff explains that emails sometimes go to multiple people and then get lost in the shuffle. Letters (as well as in-person conversations and personal phone calls), on the other hand, allow for the voice of the person to shine through and make the message more personal. Daniel Paul Drent, a Heartside resident and volunteer for Heartside’s Quality of Life Fresh Food Access Workgroup, is no stranger to trying to get in contact with his representatives. Drent has personally contacted his representatives in every capacity available to him including phone, email, written correspondence, as well as in-person conversations. Before you begin, be sure to identify a person whose position has power and authority over the change you are requesting. The person you write to should be a person with some authority on the issue at hand. Address them in an official manner. While you can still use the familiar term “Dear,” be sure to address the official with their full name and title of the office seat they hold. Explain the purpose behind the letter. It’s important to let them know immediately what your letter is about. That way, the letter will quickly go into the right hands and the reader will have all the context they need for the rest of the letter. Summarize your understanding of the issue or decision at hand. You can state the general impact that you expect to occur. State your position on the issue. Describe why you feel the decision will lead to the impact you described above. Describe what any proposed changes will mean to you and your community. Inform the reader of the negatives and positive effects the decision can make on you and those you represent. There is power in numbers but there is also power in your concern. Identify all of the people who may be affected (even the ones who are not in your social group) by the decision. Statistics can be helpful here, the official needs to know which, and how many, people will be affected. Show gratitude for past support. If the official has made any actions or decisions in the past that support your cause, mention and thank them for it. This shows your appreciation for the work they have done and for the work you hope they continue. Describe what action you hope the official will take. Specifically state what you desire from them and by when; be clear if there is a deadline. If you have written a letter that opposes an action, offer an alternative solution or approach. Close and sign your letter. Thank the official for their time and consideration, be sure to sign your full name. Include your address and contact information so that they can continue the conversation with you. Once the letter is all sealed, pat yourself on the back. The Pew Research Center found that only twenty-three percent of Americans have contracted an elected official in the past year, so you have just joined a small but powerful group of community advocates. Individual advocates have more power than many realize, especially within local government. Commissioner Reppart says that he is “particularly interested in hearing about potential unintended consequences of decisions and policies for marginalized communities and people of color.” Hearing from the stories, concerns, and values of Grand Rapids’ underserved population is a priority. 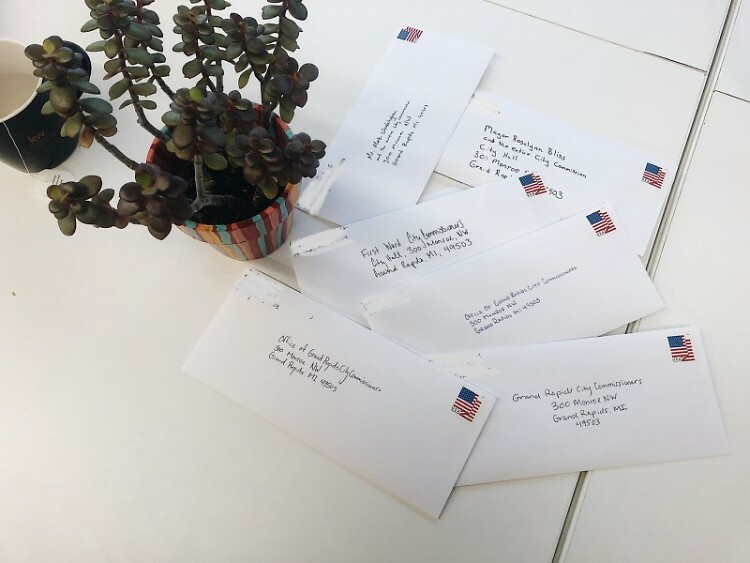 Writing letters to elected officials does not have to be scary. When different people share personal stories with one another, empathy grows. Drent shares his story because “government officials] are working for me. It is important that they know what I want, what is important to me, how I want my community to be.” Empathetic policy-making can happen when each person tells their values and stories to the people who represent them. The best way to do that? Write it down. With a mission to improve the lives of people by creating quality affordable housing, providing essential support services and serving as a catalyst for neighborhood revitalization, Dwelling Place serves families and people in 4 counties across West Michigan. Dwelling Place is powered by volunteers and numerous staff persons, guest writers create our Rapidian content. 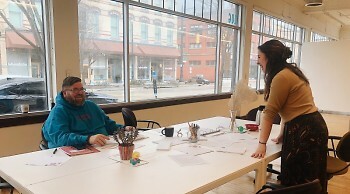 Special thanks to Learning Lab Intern Cassidy Bernhardt for her support of the 2019 Community Building and Engagement Program at Dwelling Place.